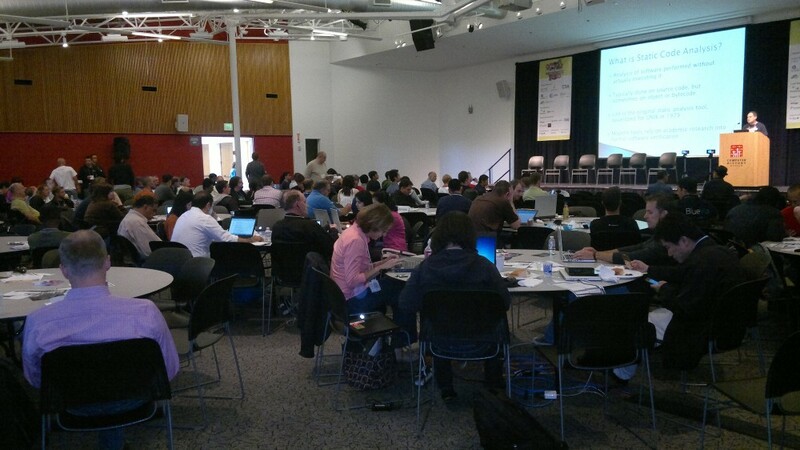 The Muther of all Hackathons was held yesterday and Friday at the Computer History Museum in Mt. View CA. The concept was simple; create a mobile app in 24 hours and compete for prizes. The event was put on by WIP and sponsored by a number of mobile development tool, library and API vendors including appMobi, Sencha, Navteq, deCarta, Immersion, Nuance, Viafo, AppsGeyser, Canappi, rhomobile, Crittercism, BlueRun, neustar, GREE and HP WebOS along with the CTIA and mobile operators AT&T, Verizon and Telefonica. There were lots of prize categories with the sponsors kicking in prizes worth over $120,000 in total including; Macbook Airs, iPads, assorted Android tablets, an HP TouchPad and various cash prizes ranging from $100 to $1000 along with free advertising and promotional packages. Friday kicked off with a series of presentations by some of the sponsors where they touted the advantages of their products and and went over the qualifications for the categories and prizes they were offering. 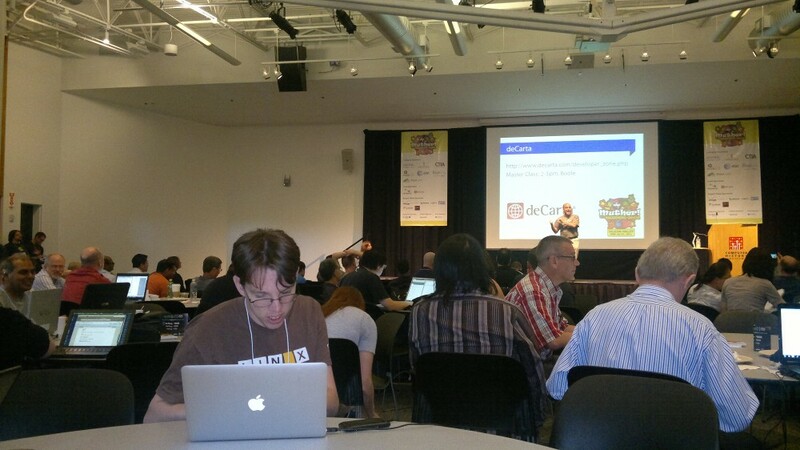 At noon on Friday the main event kicked off with the hackathon participants spreading themselves out over the spacious second floor of the Computer History Museum. Developers could work alone or in teams of up to four. The organizers and sponsors kept everyone fueled with frequent and plentiful drops of food and beverages. Expert tables manned by sponsors provided one on one help for thoese who were coding while master classes continued though out the afternoon for non-hacking attendees. 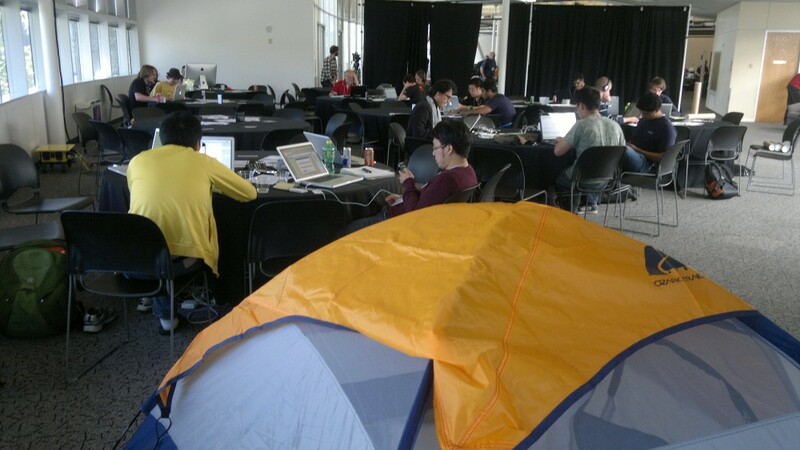 Hacking continued throughout the night with a pup tent available for anyone needing a quick nap. Tacos and beer appeared in the early evening. At noon Saturday coding ended with a hearty lunch served with beer and wine. Then it was showtime. Each competitor or team had two minutes to do a lightning round presentation. There were over 60 apps presented in all. To keep the presentations from taking all night the organizers wisely stipulated that any time setting up computers, etc. on the stage counted against the 2 minutes. While the rule wasn’t strictly enforced, everyone got through the entire presentation session in only about three hours. 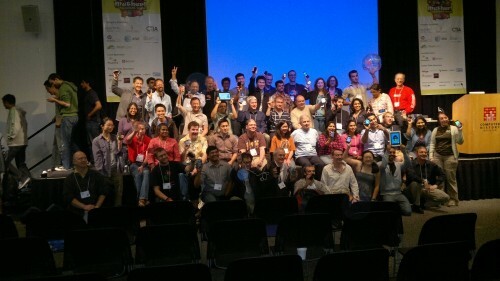 There were some very cool apps presented and the judges did a great job of awarding prizes to the most worthy. The two minute presentations didn’t give time for such niceties as introductions so I wasn’t able to get the names of the developers behind some of the winners. The overall winner of the Hackathon was Colin Karpfinger and Ronald Mannak’s Air Guitar Move, a very cool app/game that turns your iPhone into a working electric guitar. Their prize was a CTIA show package worth $25,000 that included VIP passes to upcoming CTIA shows, a booth on the Show floor, plus promotion in the CTIA show program and advertising. Yosun Chang’s Tap Shake Messenger, an app which lets the visually impaired send and read texts using haptic braille, was notable for wining prizes in four separate categories. 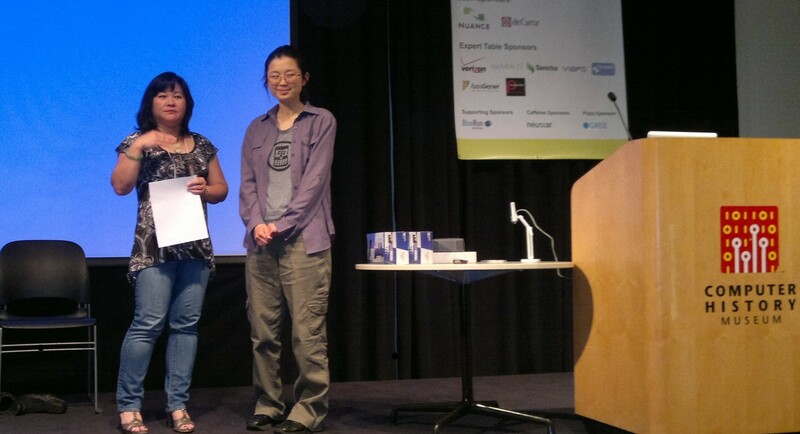 Yosun collected $1250 as second runner-up in Telefonica’s category for best app using Bluevia APIs, an iPad2 as the best app using deCarta’s APIs, a Toshiba Thrive Android tablet for winning Immersion’s “Best App that Quakes, Quivers or Trembles” and a couple of unnamed smartphones from AT&T as the best accessibility app. The youngest winner was the seventh grader who created Electrify!, an app helps you save energy and reports the savings in terms of the number of Starbuck’s Lattes or X-Box 360s you could buy with the energy you saved. Electrify! won $150 from appMobi and an all expenes paid trip to AT&T’s annual developer conference for the boy and his guardian. 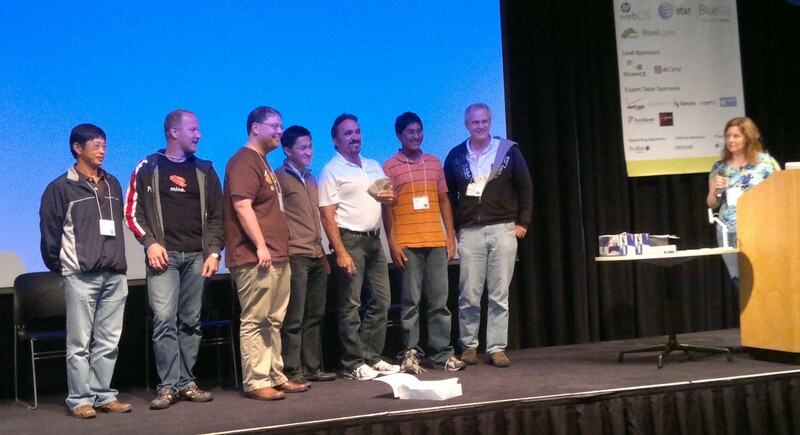 fitml.com , a cloud service for building and hosting cross platform web apps, had some of the coolest and most hotly contested prizes, a new Macbook Air for each of up to four team members. 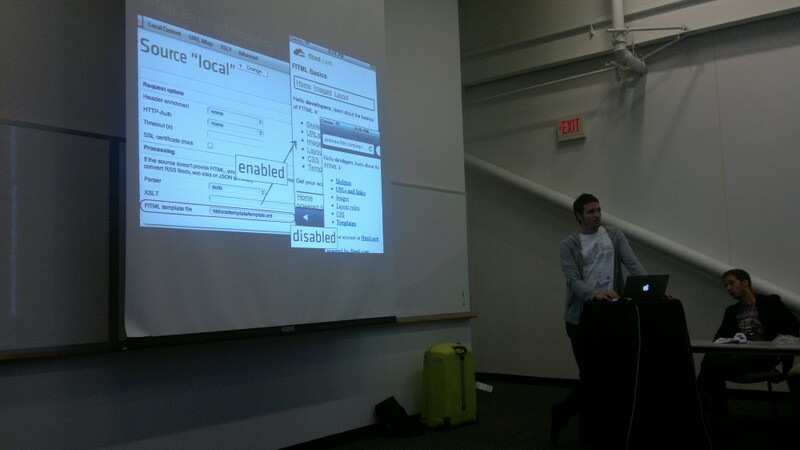 There were two categories for apps using the fitml service; Best Mashup and Best User Interface. So there were eight Airs up for grabs. GeoFanPage, which finds Facebook Fan Pages for nearby businesses took the Best Mashup award and Idea Incubator, a mobile tool for saving and sharing spontaneous brainstorms within a development team won Best User Interface. The Muther wrapped up 35 hours after it started. The exhausted participants were ready for some long needed sleep and memories of an unforgetable weekend of competition and cooperation. 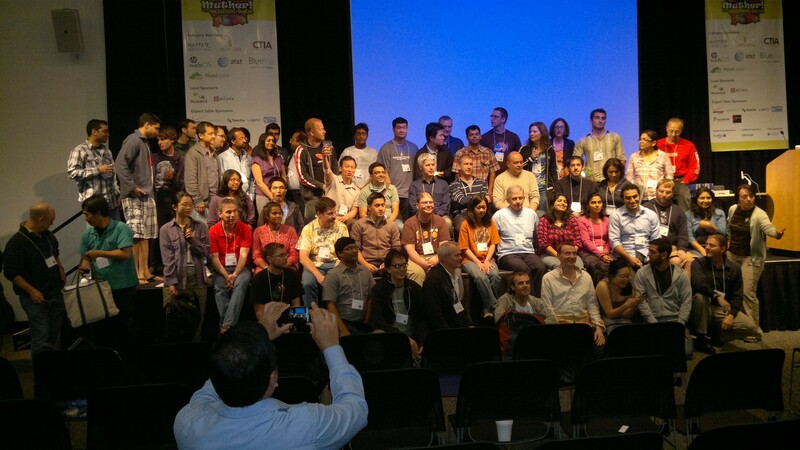 Kudos to the equally exhaused WIP organizers and sponsors for a great event. This entry was posted in Events and tagged Hackathon, muthermobile, WIP by Dennis Bournique. Bookmark the permalink.